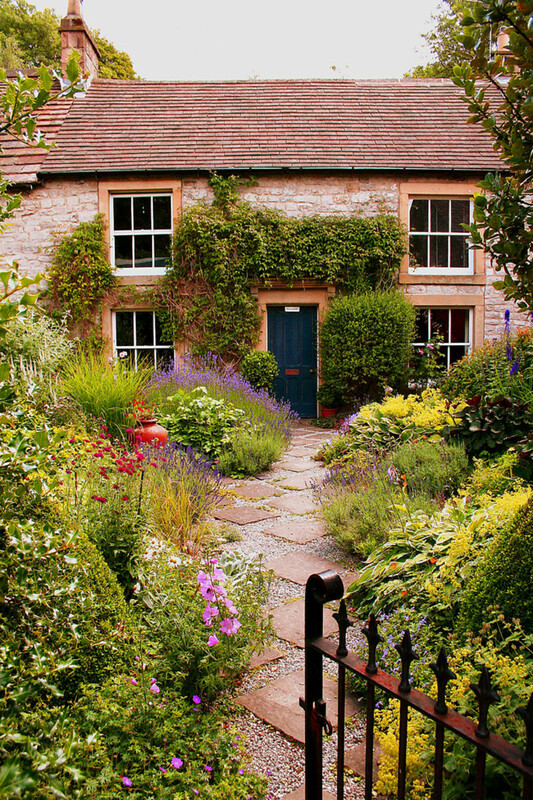 A cottage-style garden can be truly wonderful, but is it right for you? Hardscape details: A picket fence, an iron gate, a brick or stone pathway, and a traditional arched arbor can instantly create the feeling of a quaint, old-time garden. Benches, flower urns, other garden accessories and structures heighten the sense of style underpinning the plantings. An abundance of plants: "Abundance," "exuberance," and "jumbled" are all words to describe the way the plants fill and overflow the flowerbeds. Be sure to use enough of one type of plant to give a full look without a confused look of odds and ends of plants tossed together. There is a method to the madness of such places: make drifts of grouped plants in odd number like five or seven. Roses: The planting scheme will benefit from the addition of roses. The heritage/heirloom types with many petals or, conversely, the simple single roses, especially. Climbing and shrub types give the architectural grace that was seen around these traditional homes. Careful maintenance: Intensively cultivated, regular maintenance of plants, soil and weeding is needed when flowers are grown this way. This nostalgic style is a labor of love—the love of the plants! Traditional architecture: The look best matches traditional architecture, like Cape Cod, English Tudor, and other such homes. Reconciling the sleeker, modern style homes is more of a challenge. It will require some modification to meld the house with its surroundings. 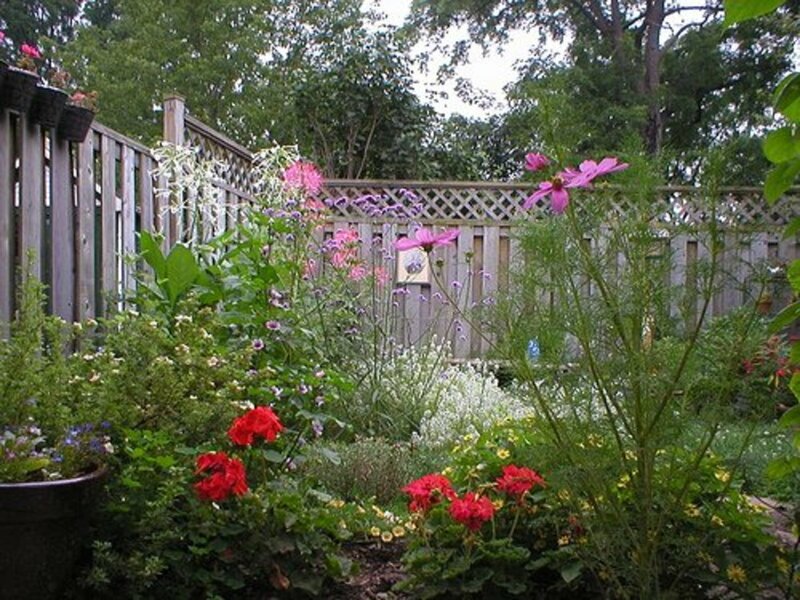 This style is informal—with plants tumbling over each other and the fences and walkways that try to contain them. What's the secret to designing these charming spaces? 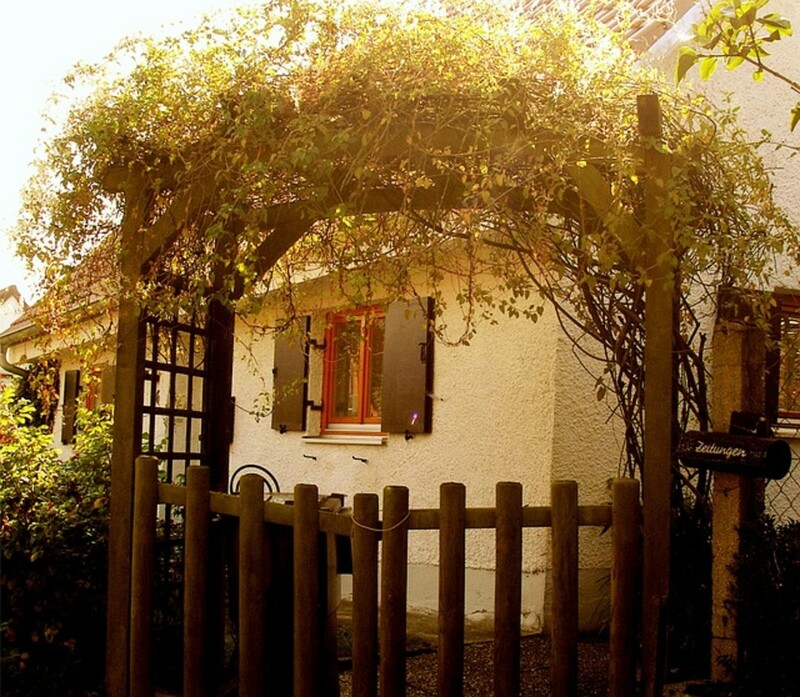 Everybody loves the quaint cottage gardens they see in pictures, or happily chance to visit. There is something warm and welcoming about the traditional ones that remind us of simpler times, grandmother's borders, full of an overflow of flowers and fruits to gather on a summer's day. How easy is it to create or care for one? 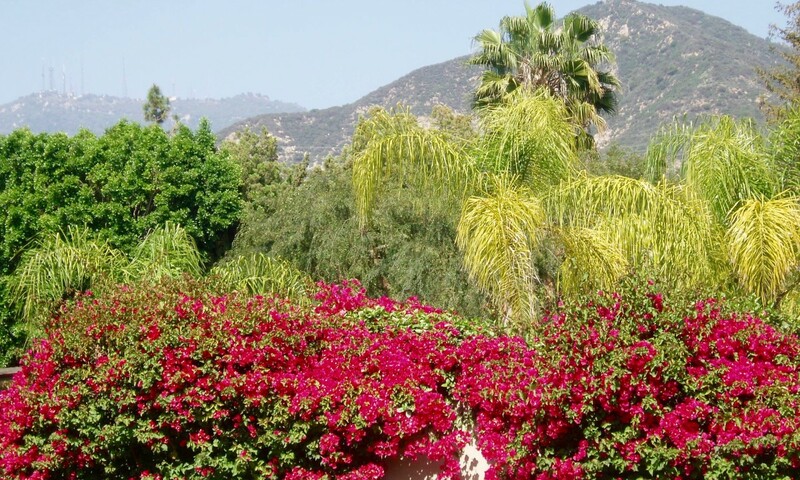 Does this landscape match the style of your home? Will it work to tuck one into a corner if at odds with the house facade? Such outdoor spaces have certain plants that give the style its own unmistakable look. These are rooted in the history of England's farmers and villagers. Will those plants match the landscape needs of your site? Let's walk together into these quaint front yards, through their gates and around their pathways. Maybe such a plan is perfect for your own home landscape. Or if not, you can enjoy our guided tour through this old-time enclosure fairly bursting with fruits, flowering bushes and fragrant blooms. Certainly a place to dream about . . . but is it the one for you? These were originally the food and flower patch of everyday tenant farmers; those who worked on other peoples lands, but had a little house and yard of their own. They were small, practical plots, meant for the feeding and support of the family. They were intensively cultivated, every little plant was placed cheek by jowl to make the best use of the small space afforded. This meant that the plantings were mixed: fruit trees, small fruits, medicinal and culinary herbs, and a few pretty things thrown in just for the love of it. Originally these areas adjacent to the house were meant to be low maintenance with the main effort dedicated to the kitchen vegetables and fruits. It is only in relatively modern times that the "tidy mess" became a complicated endeavor of constant flowering. As the Victorian era reached a frenzy of decoration and love of the exotic and the oddity, there grew a hunger for these more humble flowerbed designs. 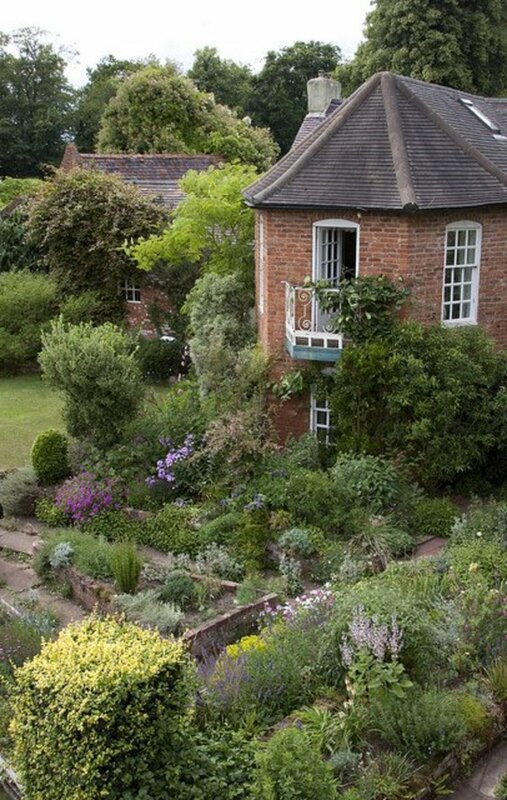 Quietly maintained by country folk who had remained unchanged by the whims of fashion, influential gardeners took notice..
A tastemaker, William Robinson, wrote passionately about these older types of gardens and their simpler flowers and abundant plantings. Gertrude Jekyll joined the movement which swept away the bedding and parterres to a large degree, and implemented their ideals of a picturesque and a more artistically natural feel of style. 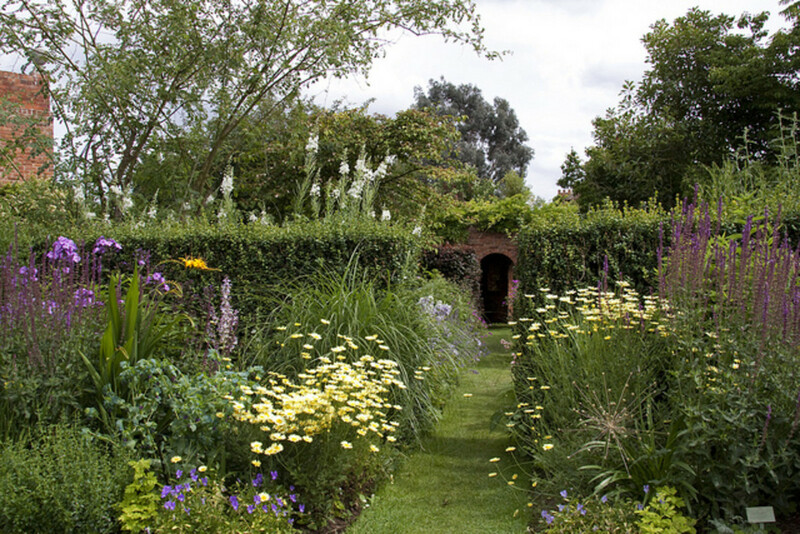 Many of what we call "English gardens" have a distinctive form of naturalistic planting that take their cue from the old dwellings of small English villages. The English style can vary widely from the grand, sweeping estates of the landscape movement of Capability Brown to the more "gardenesque" styles of the Victorian age. They also include this form which we love so well. 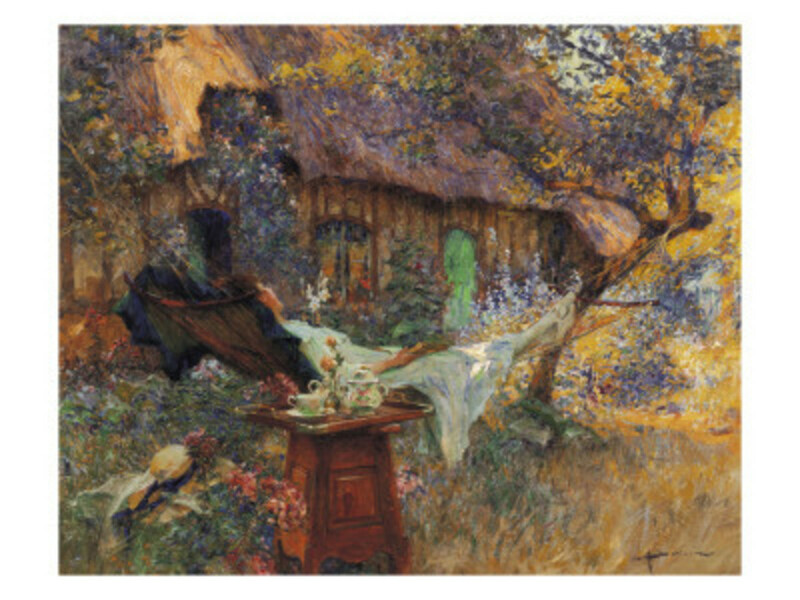 The growth of the middle class coincided with the popular sentiment to create a home with a garden that included the natural look of the old familiar flowers. The rigid regimentation of plants in rows, bedding out, or tightly manicured flower beds gave way to the more romantic freedom of William Robinson's vision. William Robinson wrote "The Wild Gardener" and changed the appearance of English gardening forever afterward. He persuasively argued for the old fashioned flowers and planting style of the traditional cottagers. It revived and became the iconic look that we equate with British landscape design today. A place filled with plants jostling each other for pride of place, outdoing each other with blooms. They regale us with their joie de vivre as they burst forth from the earth, woven together and entwined in each other's arms, scenting the air freely with rose, honeysuckle, and lily. This is what most of us think of as the ideal flower garden. Usually a smaller space enclosure surrounded by a fence. It is often punctuated with straight paths on an axis, the main one leading directly to the front door which is draped with climbing rose or clematis vines. This is also plainly a food garden, if grown traditionally, and fruits are grown to delicious ripeness, while carpets of thyme can be seen among the stepping stones and along the path, perhaps with a seat of its own. Renewed interest in "edible" and "sustainable" may return these grounds to their roots. Places where the beauty of plants and their usefulness, once more, go hand in hand. They were grown by common hardworking people, but who still aspired to beauty in the best manner that they could contrive and afford. Most of this style was considered passé during the times that they were actively created and used. Harmonizing the surroundings with the architecture. The modern form of this look is almost always a flowery one. While vegetables might be welcome, they are rarely included when designing such a plan. But with today's trends, it could be time to return to the former methods of growing herbs, vegetables and flowers all together. With the new emphasis on edibles in the front yard, it might be time to incorporate more of the salads and herbs into the streetside landscape plans if this is your desired style. They can be almost hidden in among the blooming plants with some of the colored foliage of lettuces or chard actually adding bright color. Two good places in the landscape for such plantings might be a small area by the door, an entry area enclosed with a fence, or a border next to the driveway. Most homes will harmonize with this style, but a strongly contemporary one with modern lines may be visually jarring. It has a feeling that the two aren't knit together properly. 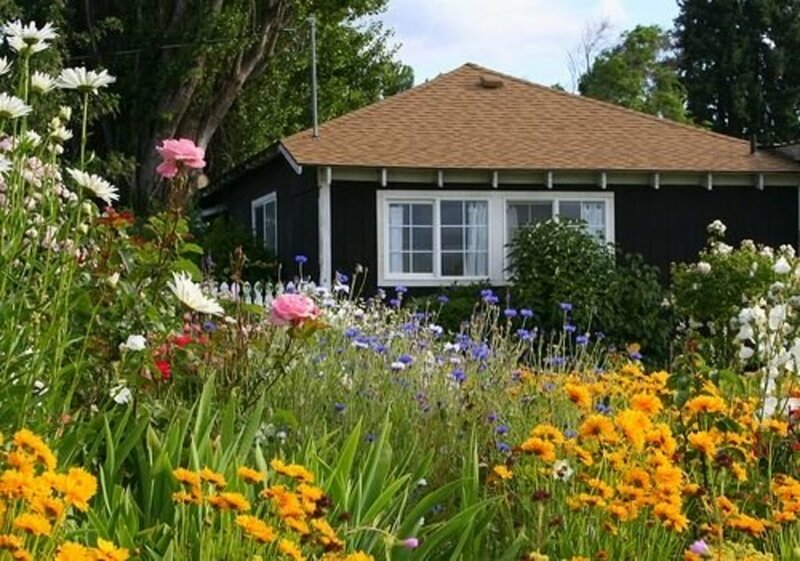 While Cape Cod style and traditional bungalows seem made for the simple cloud-like drifts of flowers and vines that comprise a proper cottage garden. Generally, if you have a picket fence, you can have this sort of border! Rustic looking fences and Craftsman styled houses will look ideal with this abundance of plants. Not for the front yard? Make a personal space hidden away in the backyard. It is a tried and true method is to make outdoor "rooms", sectioned off areas of the landscape to create a different sort of design from those adjacent. Utilize bushes, either in a shrubbery or a hedge, and create your version of the style in a compartment of its own. This is one way to have your cake and eat it, too, when the house is a style that looks jarring with an overflow of flowering plants. Your own personal bower. Is this style for you? Don't let the simplicity of the look fool you. These are intensively cultivated properties which require a good deal of attention and labor from the gardener. Someone who has time to work in the flowerbeds and among the vegetables, pruning the fruit trees, and keeping everything healthy and in good order. Does that describe you? It isn't an easy or maintenance free sort of yard. However, it is a beautiful,rewarding one. Choose an area right outside the door, or along the entry path, and begin planting a mix of herbs, annuals and low-growing perennials. Even the plants of these quaint plots seem to be on close and friendly terms, since they are characterized by flowers bursting the seams of the boundaries. Yet, it is important to remember that plants that are too close for comfort create conditions ripe for disease. Weakened plants are struggling to get enough nutrients, and moisture. Air space for circulation around each plant is also desirable to keep plants growing their best. Let your abundant flowers come from healthy, well-placed plants, and not from stuffing too many plants in a cramped space. Mentioned often, just what makes a plant "the right one"? Besides being suitable for your climate and soil conditions, ease of care is a factor for a busy home owner. Plants that remain healthy without coddling, sprays, or dividing are a boon. These qualities won't turn this high-maintenance style into a low-demand type, but it will increase its practicality for modern homeowners. Start out with stalwarts like Iris, peonies, and hardy roses, include good fillers like daisies, baby's breath (Gypsophila), and then add the accents of spires and spiky foliage plants to give height and vertical interest to the planting. Another way to design it: choose a basic central group of flower forms and then add some from other groups to spice it up. Basic groups of flowers might be those with a daisy form, or those with a lily form, perhaps accenting with iris forms or spires of lupines. The daisy group of flower forms, called the compositae, is the largest category with an inexhaustible number of plants, including the sunflower and aster, as well as daisy groups of blooms. Many of the compositae group make wonderful flower bed choices, with abundant growth and a cheerful look. Vines drape gates, arbors and fences. Drifts of flowers fill the spaces, they are abundant and blowzy. The plants rule here! If you decided that this is the look for you, it is time to pick the herbaceous plants, shrubs and trees to grow. Delphinium for height, mounding daisies for form and the daylily anchors the design with color and contrast. Daylilies (Hemerocallis) make perfect plants for traditional, yet easy care landscapes. That makes them a great choice for today. 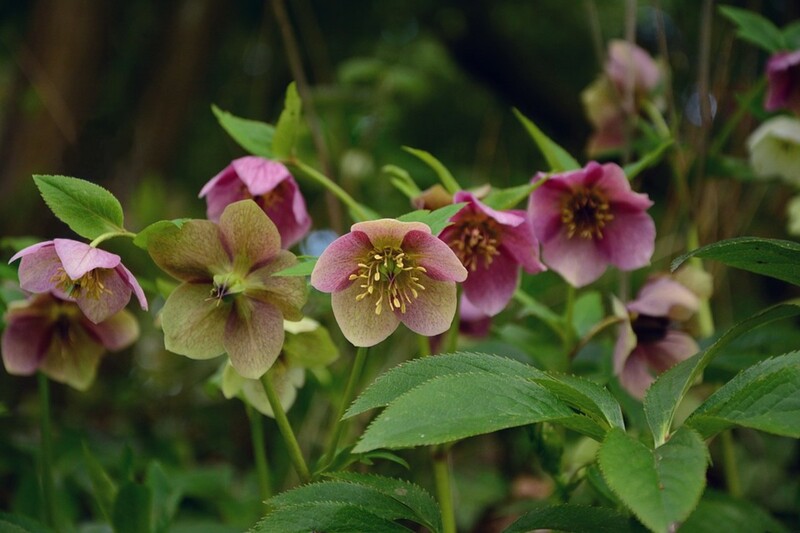 Hardy, without disease problems, in an ever increasing color range and form, heights, and bloom times. Hybridizers and homeowners love them because they are so accommodating to those who love both beauty and good landscaping qualities. Hemerocallis can solve many design problems: like what to plant in the shade or near a roadway. Once acquainted with them, you can combine the different heights and bloom periods to give a spot of color or a large drift that never seems out of bloom. The trick is to stagger the expected bloom schedule. The daylily will bring a burst of color during the time when most of us don't want to slave outdoors. Need color for most of the summer? Don't want to have to follow a special list of maintenance tasks? 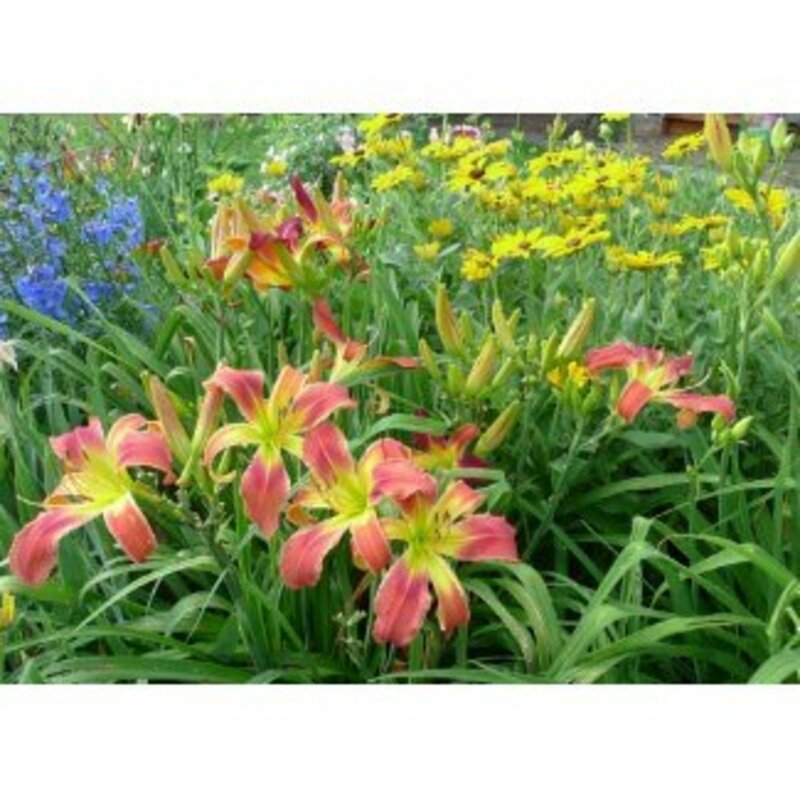 Daylilies are today's landscape choice for their healthy foliage and cheerful blooms. 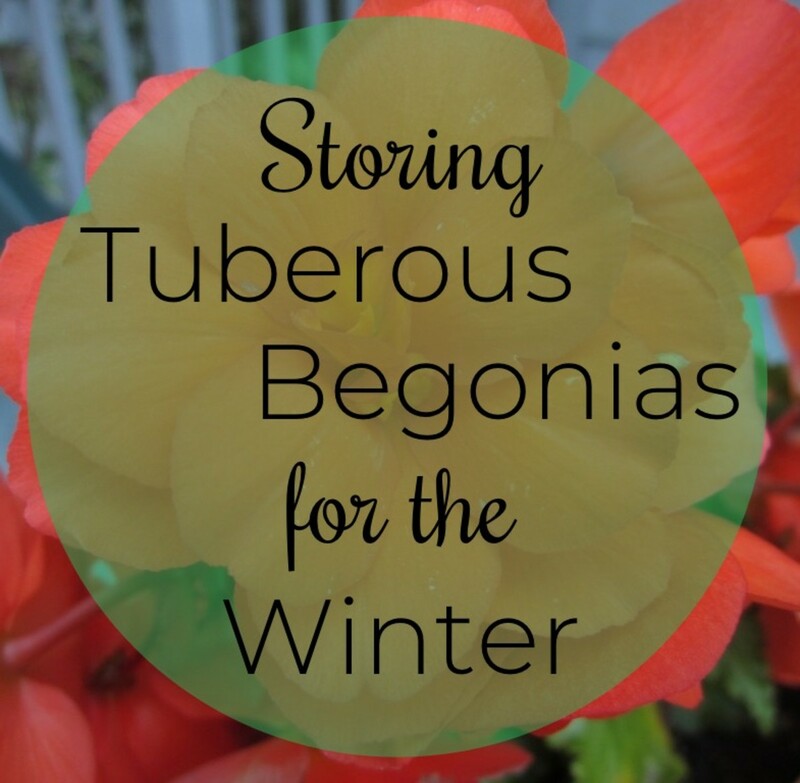 Consider making this perennial the backbone of your flower bed. Combine them with spires and daisy shape blooms for contrast. Easy to grow flowers: just sow and grow. Find the perfect ones for a corner spot, even if you can't give over the entire yard to this type of gardening. Many books list varieties to look for: start with nigella, calendula, and Shirley Poppies. 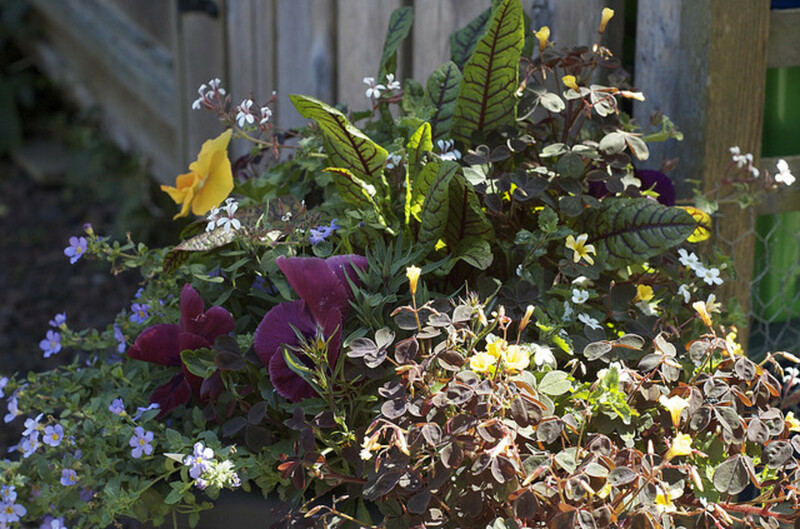 A plentiful overflow of flowers in containers add to the full and lush look. "All about charm and character, still they rely on the same basic principles as any other style. Start by creating a basic shape of hard landscaping, then add 'core' trees, shrubs and perennials that give the landscape its personality. Leave the fine detail until last." Different forms like spires, mounds, and vining plants are used in blocks or drifts, no less than three to five plants of the same type together. Hollyhocks and sunflowers give height, while phlox paniculata or daylilies provide color and larkspurs or foxgloves give a vertical line for variation. Don't be dotty about it, place groupings for the best effect with contrasts of form and texture. Photos say it all when it comes to how it should appear, but you may also want some information on just which plants give the look. This guide gives much more detail for those who wish authenticity. Most books just tell you about the "idea", this one gives an overall view and how-to in making a complete Cottager's dream. This may not be the newest book on the topic, but it is one of my favorites because it covers a wide range of the old Village life. An inviting gate will give form to the entrance and a frame for the abundant flowers that you can't wait to plant all around it. It is detail like arbors, fences, pathways and gates that give evocative focal points to your plantings. Create an authentic feeling with an inviting gate entry. Pickets, lattice and supports will all evoke the traditional yards of yesteryear when such boundaries were an important protection of the cottager's kitchen vegetables and simples. One of the most iconic features is a rose-covered arch leading from the front walk to the door or as an entry into another part of the property. It was a Gertrude Jekyll favorite, to include in her designs along with specific suggestions on just which climbing roses to add. (Roses were almost always the plant of choice). Today gardeners have a much easier time choosing a desirable climber from the world famous breeding of David Austin. He creates roses that have the form and fragrance of the heirlooms, but with the blooming qualities of the modern ones. Such simple structures give so much charm to a landscape. Vintage accessories help create the right atmosphere, along with the plants and hardscaping. Heirlooms are the ones that originally populated the old places. Passed on through generations, saved for their qualities that ranged from flowers of unusual colors to produce of exceptional taste. 'Carding Mill' is a variety that will quickly make a bushy, rounded shrub up to 4 feet tall. This full shape is what makes a great heirloom rose. A myrrh fragrance and many petaled blooms are the old fashioned part of this rose, while the all season blooms and warm apricot color are products of modern breeding. Today's shrub roses are bred to give healthy foliage, shrub qualities, and long season of bloom. These are not the spindly hybrid teas which need coddling and constant spraying. Include at least one in your plan. One of the most recommended shrub style roses has to be the 'Abraham Darby' English Rose. Nothing blooms for a longer season than rose bushes. 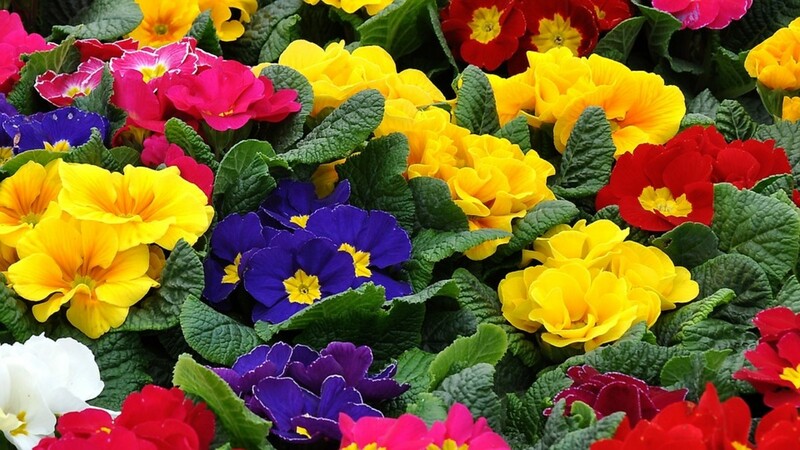 Consider pairing them with daisies and campanulas for a cheerful bed of long-lasting blooms. This variety is one of the more hardy and healthy varieties of the David Austin English Roses. Fruity fragrance and good health make it a winner. Shrub roses are one of the major plants to make a garden of this type look authentic and traditional. This is one of the finest of the celebrated David Austin English roses. It has a gorgeous, rich fragrance and a full-petaled bloom that will impress you and win your heart. I have grown a number of Austin roses. Their form is so superior to many of the modern roses—along with their exceptional fragrance—that if you were to grow only one rose, this one would be on the short list of choices. Even these, which are reputed hardy, must have protection in my zone 5 climate. and the soil and sky as canvas. Video instruction on how to make your own thyme seat is perfectly charming! The idea of a thyme bench has always fascinated me—although in my climate the frequent rains and otherwise inclement weather challenges the wisdom of it. Still, it would be a marvelous addition for a place with plenty of mild days in which to sit and enjoy the scene from a fragrant bench. The many tutorials on growing plants, planning, and combining colorful blossoms abounds online and in your local library. It is easy to create this type of landscaping, if you decide it is for you. Fruit or Flowering Trees? Or Both? Ornamental trees are smaller in mature size and provide seasonal color. Smaller trees, especially if they are filled with fragrant spring bloom, are ideal plantings for a cottage-style place. If you are interested in harvesting fruit, there are many dwarf varieties to choose from. Barring that, the art of espalier reduces the size of a tree while generating perfect conditions for fruit. They are labor intensive with particular care to the pruning techniques. Most homeowners would be happiest with small ornamental trees because they allow more sun and nutrients to be available for plantings surrounding them. 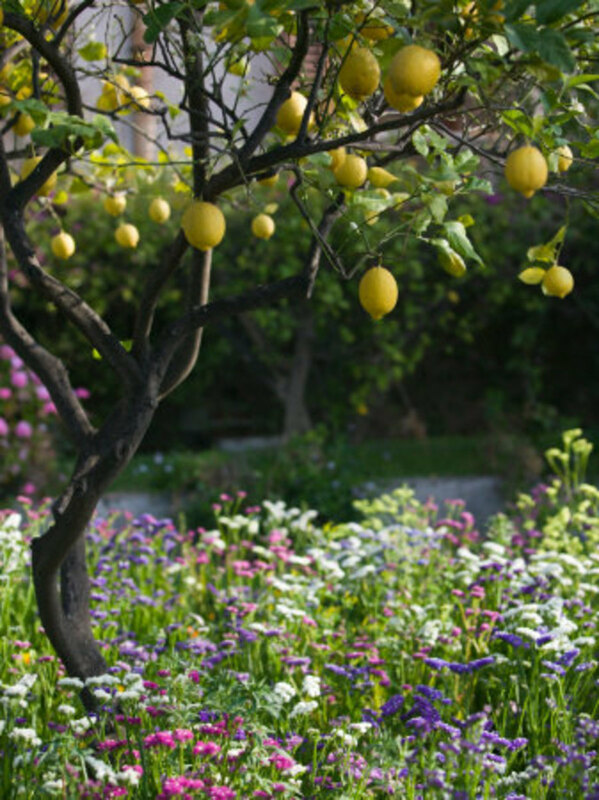 Fruit trees require a great deal of care in terms of spraying, pruning, harvesting, which isn't ideal if only a landscaping feature is desirable. However, they are of the utmost priority if you wish to provide for your table. Cherry trees are ideal. They bear fruit, they are full of spring blooms, and they make handsome trees with year-round interest with their shiny, mahogany-colored bark. If you have a large enough yard you may grow a sweet cherry that is self-fertile like the 'Stella' variety, otherwise it is best to plant one of the tart pie cherry trees. If you like pears, chose one of the dwarf varieties that have a reputation to taste good. They are pretty and bloom abundantly in the spring. Don't plant where dropping fruit would create a problem, such as near a driveway. Peach trees are usually smaller in size, and they need consistent pruning. Remember their large soft fruits and don't plant where they could be a nuisance. 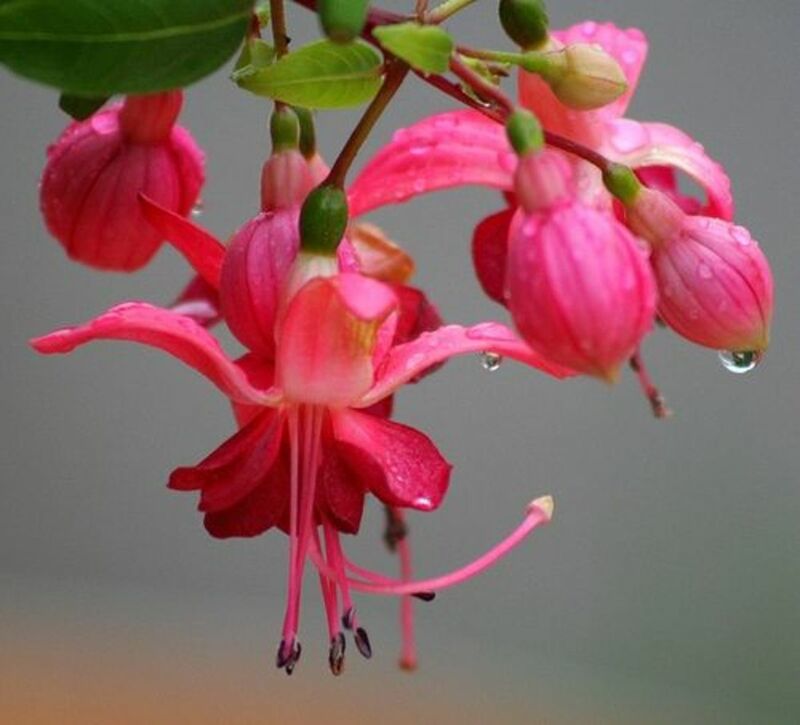 They have a lovely pink bloom in the spring and come in dwarf sizes for smaller spaces. While these suggestions would be an authentic feature, for some modern landscapes and schedules an ornamental tree is best. Fruit trees can be messy, and if you are not interested in harvesting the produce, there is no reason to put up with the care that they need. Many of these heirloom plants are easy to grow and care for, that is one of their attractions. Choosing the right plants, and cultivating them well, is important. With some guidance and your own loving labors, you will soon make a scene like this bloom outside your own windows. Visually rewarding, they are a great showcase for the person who loves to put time into their yard. Perennial plants are the backbone of a beautiful, lasting design, and a good resource book is almost as important a tool as your spade. Learn how to put together a plan with charm and an English village look: videos and books help with the ideas and layouts. Remember that plants can be moved around when the results don't look as planned. Have some fun with the process. Make room for chickens—even urban properties can have a chicken or two. My grandmother raised chickens in her urban garden. In those days, most people did, if they could spare the room. It is an idea making its way back around. Urban places are making room for chickens, and they can be a natural part of the cottage garden, too. Their eggs are welcome, and they forage for insects. Chickens do need care, and they must be controlled—both from bothering neighbors and from overzealously scratching around in the flowers. Despite those considerations, many people are finding they love raising some hens in their backyard. A garden is a growing thing and plans help keep it going in the right direction. A journal organizes your plans, pictures, ideas and keeps track of what you have planted and whether it succeeded or not. Simple notebooks can be used, but a binder, especially dedicated to your garden, holds everything for years! Journals are a great way to keep track of your plans, plant names, costs and just about any information that is important to your gardening experience. Look for one, or make one with pockets (collecting seeds, this year? ), handy forms and water-resistant covers. This is what I underline in all my advice to fellow gardeners, especially beginners: start small. You can always enlarge it, but if you are overwhelmed with work, weeds and failing plants, it is no longer fun, recreational or beautiful. Grow into your garden. More advice on designing your own yard: Make sure the soil is improved with plenty of humus. Tools and accessories are necessary for the work involved. They can add to the old fashioned flavor that makes this type of garden so charming. Consider everyday items such as watering cans or tool storage to be part of the entire look you are aiming for. Old rakes? Don't throw them away. Turn them into a tool-hanging rack. Old worn-out wheelbarrow? The perfect plant container for lettuce or pretty annuals. Bathtubs and sinks? Water features. Or planters with just a little DIY addition of paint. Such lush growing techniques intensively use the ground benefit from composters that not only save space but render the compost in record time. A very green thing to do, in the spirit of old-time cottagers. If there is anything true about everyone's garden it is that it changes! Thank you for the kind comments on the article, if it inspired you, it served its purpose. Not only can we decide that a style is for us, but we can add elements of it to the one that best works for us. Small ornamental trees can also frame a garden- but that lovely note of blue would be missing. I love wildflower gardens. They are the ideal setting for a quintessential English cottage. @laurenrich: Why than you! Much of it is due to the sheer beauty of the flowers. @lionmom100: It is a joy, isn't it? 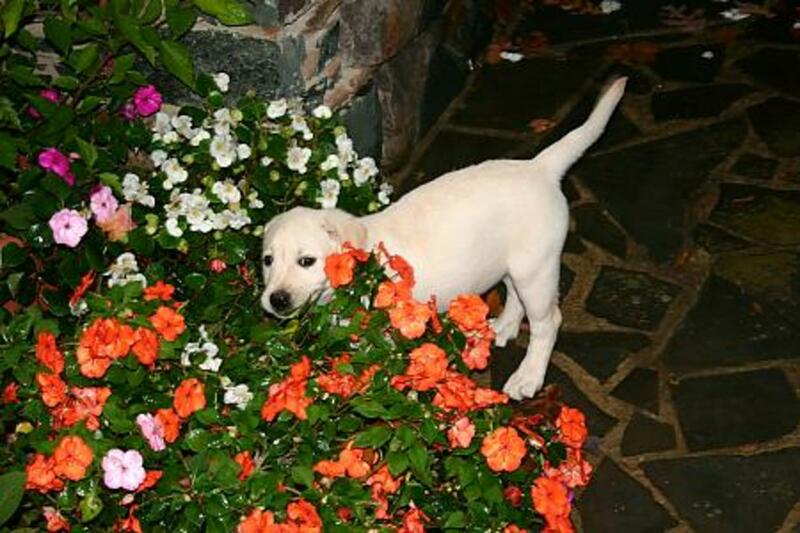 Glad you have a yardful of flowers to enjoy. @acreativethinker: You can't help but admire the luxuriant flowers of a cottage garden! What beautiful photos, and what a beautiful lens! Congrats on your Purple Star. Aren't they encouraging? Such lovely cottage gardens. I love my garden and love cottage style. This is one of the most beautiful lenses I have visited. Thanks for sharing. Back for a visit to this beautiful lens: a serene visual pleasure! Always a pleasure to visit a fellow gardener's lens's - &amp; this one is a good 'un! I really enjoyed seeing all of the cottages on your lens. They look like a wonderful place to spend time. Hi great garden lens, I enjoyed reading it. I do enjoy gardening myself. Blessed and added to my lens...Squid Angel flinnie. A very inspiring lens. I'm in the middle of clearing our garden and starting to get it looking cosier than it does at the moment. Lots of work to do but lenses like this are always inspiring to read. I just love cottage gardens and this lens in fact, so beautiful in and understated way! One of the most beautiful and informative lenses I have come across, pinned to my board: How Does your Garden Grow and Angel Blessed. I love cottage gardens. Unfortunately, the look would be very difficult to achieve in the desert, where I live, but I enjoyed your photos. I love beautiful gardens, but currently have no access to gardening, so I will enjoy the process through your wonderful article! It was so relaxing to look at all the lovely garden pictures and read your marvelously descriptive words. Kudos on a wonderful lens!! Beautiful! I love the look of a Cottage Style Garden and sure enjoyed my visit here. Thanks. Such a lovely lens! Traditional Cottage Gardens are so beautiful and you did an excellent job showing them. Well deserving of the Purple Star. Congrats. Such a beautiful and colorful lens! I really love the careless simplicity of cottage gardens, really cozy. Thanks for sharing. I love this style of gardening too. As an artist, I am all about details, which makes cartooning nearly impossible. This carries over to my gardening, while I want a loose, overflowing and random arry of flowers and greenery, I tend to plant in a formal way. I think your lens will help me. Thanks! Oh, so pretty! I'd love to plant a cottage garden but living in the desert makes me think it might now "take." Lovely photos! My favourite garden style! A wonderful lens with lots of ideas for planting and design. Thank you. this is a breathtakingly beautiful lens - so here are some Angel Blessings. I love cottage gardens! And some of the pictures you have on your lens are just amazing. Nice lens! Excellent lens. I'll have to add a cottage garden to the old bucket list. I have always dreamed of having a garden like these, but never came close. So beautiful! Thanks for sharing. Blessed! I sent this lens to my mum - she would kill for a cottage garden. Lovely lens. Hi! I gave a "like" for your lens for Garden Week. Very beautiful and informative. Thank you! Yes, the Cottage Garden evolve over the time, but I still love the first picture you have in "History of the Cottage Garden" module. Great lens. If only a cottage garden could spring up, fully developed; that would be sheer heaven! @writerkath: There is something so cheerful about these gardens! Even if only in pictures. I really enjoyed this beautiful lens! 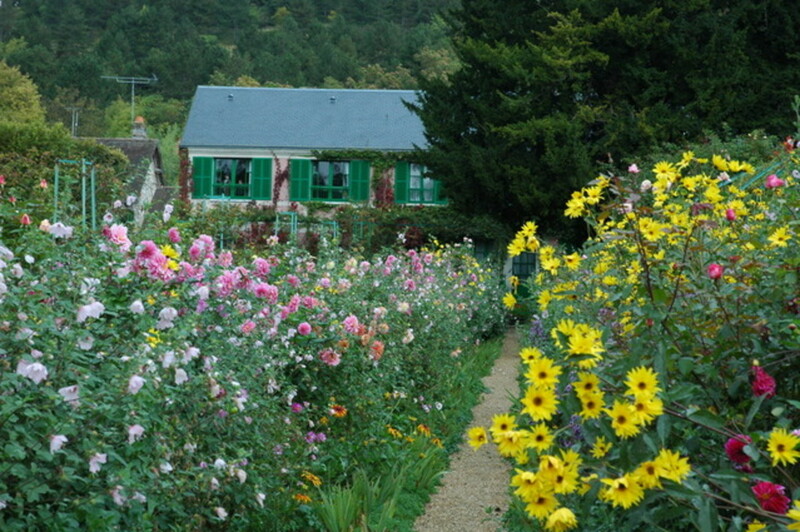 You have me dreaming about my own cottage garden now. I love the gardens. This is the inspiration I need to get my cottage garden looking beautiful. I do love a cottage garden as they bring back memories of my grandmother's flower garden. Beautiful lens, loved the pictures and found the info great. If only they taught this in schools. Great great lens! Inspired me to rethink mine. Thanks! Thank you, for all the comments. Happy gardening! I'm planning to expand our garden. Thank you for the valuable ideas. Gorgeous pictures, I love cottages and really have always wanted to live in one, thanks for a very nice lens! What a beautiful article and collection of ideas. Thanks! How beautiful. Sigh I miss my garden. Well thought out and well designed lens with great info. Of course where cottage gardens are concerned no amount of info is too much! 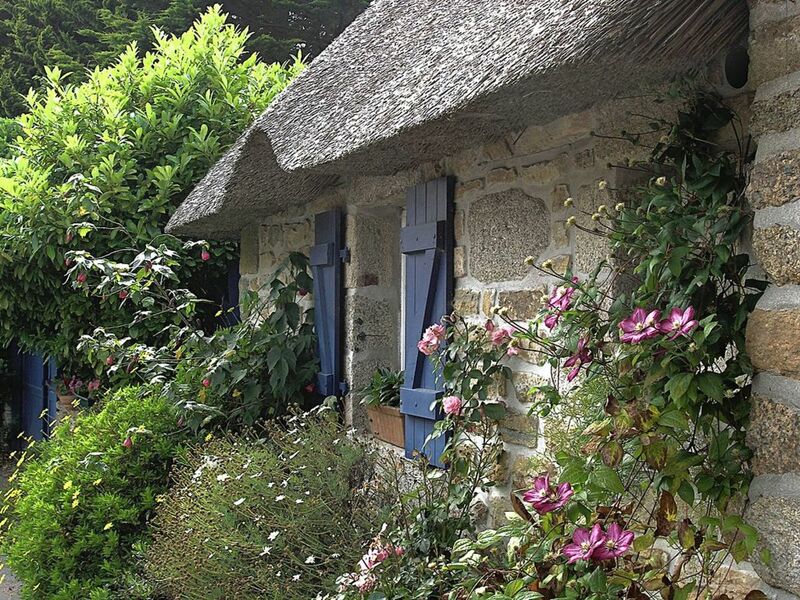 I want a garden cottage now--at least in my dreams. Thanks for the wonderful walk through your lens. It was very satisfying. I have always wanted a garden like this! How lovely, thank you for posting this! I love the cottage garden! A wonderful "vacation", I would say! Thanks for such a beautiful and inspiring lens! Blessed! I always wanted to have a lovely home with a big garden that you could get lost in and grow lots of wonderful flowering plants. I guess for me now that is going to remain a dream unfortunately, unless we win the lottery. Lovely pictures and ideas, blessed. Beautiful lens. Beautiful gardens and information. Thanks for publishing this. Blessed. 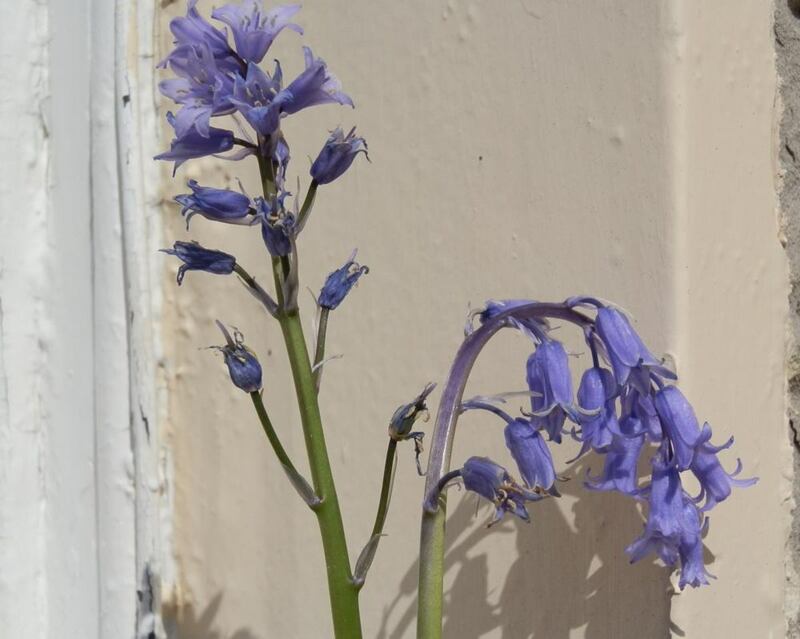 Thank you for sharing these beautiful photos of cottage gardens! 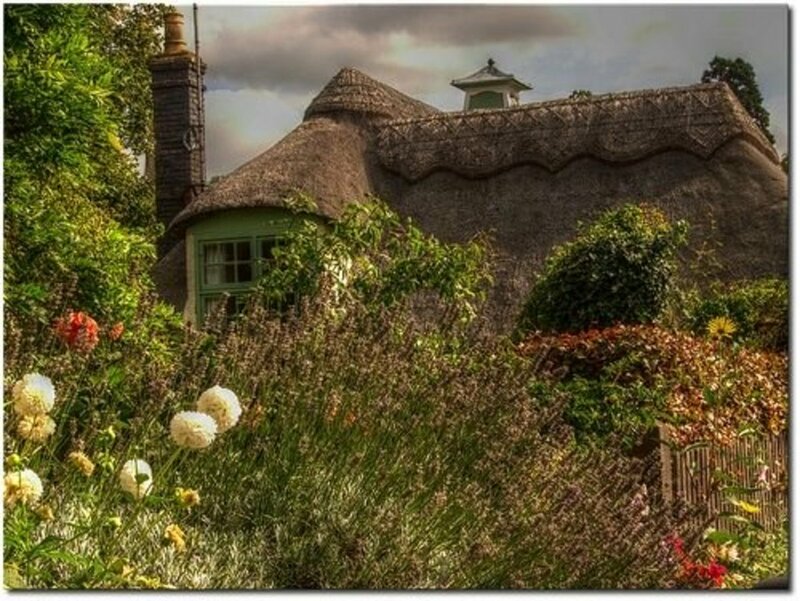 I especially liked the house and garden in the photo under "History of the Cottage Garden". And the garden at the "Modern Home" is stunning! Wow! Beautiful gardens and you are right, I do want one just like them! Your advice to "start small"? That was sooo good for me to read..lol. When I looked at the pics I thought oh yes I am going to do that. I think normally I would not think small and get discouraged so thank you!! Thumbs up and blessed. I'm trying to work up the nerve to turn my small front yard into a cottage garden -- complete with vegetables. I know how much work it would be, and wonder what the neighbors would think. My dogs make back yard gardening a bit difficult (impossible?). Love all the beautiful photos here and the terrific information and links. Very inspiring! I would love to have a garden like this at my home to relax in - if only it didn't take so much work to keep it up. I wish I could hire a gardener. lovely lens! I love cottage gardens, I think of them as the original edible landscape. Also I'm more inclined to think of the early colonists in America, rather than their counterparts in England when I think of cottage gardens. Beautiful! 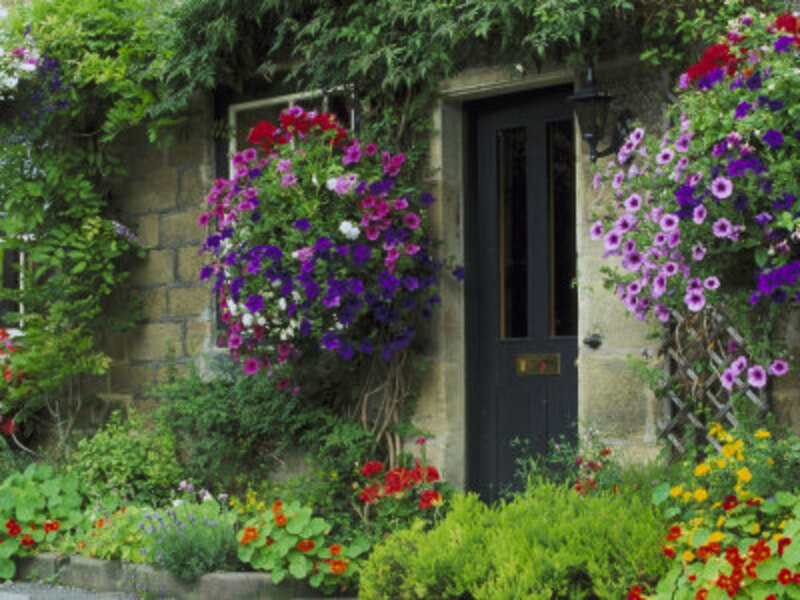 I love an old-fashioned cottage garden--I wish I had the know-how and the time and energy to create one! Wonderful lens!